Alzheimer disease is a disease that affects the brain and nervous system. It happens when nerve cells in the brain die. The disease gets worse over time. It is a type of dementia. The disease does not affect a person’s movement. He or she can still get around normally. Loss of the ability to know who people are. This even includes people whom the person knows well such as a child or spouse. The symptoms of Alzheimer disease may look like other health conditions or problems. Always see your healthcare provider for a diagnosis. No single test can diagnose Alzheimer disease. A healthcare provider will first rule out other conditions. But the only way to confirm a diagnosis of Alzheimer disease is to examine the brain after death. An autopsy can show changes in the brain that mark the disease. Complete health history. This may include questions about overall health and past health problems. The provider will see how well the person can do daily tasks. The provider may ask family members about any changes in behavior or personality. Mental status test. This may include tests of memory, problem solving, attention, counting, and language. Neuropsychological testing may also be done. This will likely be a series of tests that assess your brain function. It usually involves answering questions and doing certain tasks. Other lab tests. These may include blood and urine tests to find possible causes of the problem. Brain imaging tests. CT, MRI, or position emission tomography (PET) may be used to rule out other causes of the problem. At this time, Alzheimer disease has no cure. There is no way of slowing down the progression of this disease. And no treatment is available to reverse the changes that the disease brings on. But new research findings give reason for hope. Several medicines are being studied in clinical trials to see if they can slow the progress of the disease or improve memory for a period of time. Exercise and social activities are important to help manage the disease. So are good nutrition, a healthy lifestyle, and a calm and well-structured environment. Can Alzheimer disease be prevented? Because doctors don’t know what causes the disease, there is no way to prevent it. But some risk factors for dementia can be modified with lifestyle changes. Taking good care of yourself by controlling your blood pressure and glucose can reduce the risk for dementia. Head injury increases the risk of developing dementia, so it is important to wear a helmet when taking part in dangerous activities. Also wear a seat belt and take other measures to prevent brain injury. What are the possible complications of Alzheimer disease? Alzheimer disease is a progressive disease. This means that memory problems and problems with doing daily tasks gradually get worse. Each person is affected differently, but people with Alzheimer disease have mood and behavior problems that make it hard for family members to care for them. As a person is less able to care for himself or herself, families or others must help with personal care, meals, and daily activities. People with advanced Alzheimer disease will most likely need to stay in a place that specializes in care of people with memory disorders. Care programs for people with Alzheimer disease differ depending on the symptoms a person has and how far along the disease is. These programs can help a person and his or her family manage the disease. Plan a balanced program of exercise, social activity, good nutrition, and other health lifestyle activities. Plan daily activities that help to give structure, meaning, and goals for the person. As the person is less able to function, change activities and routines to let the person take part as much as possible. Let the person to do as many things by him or herself as possible. The caregiver may need to start an activity, but allow the person to complete it as much as he or she can. Give "cues" to help the person. For example, label drawers, cabinets, and closets to let the person know what is in them. Keep the person out of harm's way by removing all safety risks. These might include car keys and matches. As a caregiver, understand your own physical and emotional limits. Take care of yourself and ask for help if you need it. 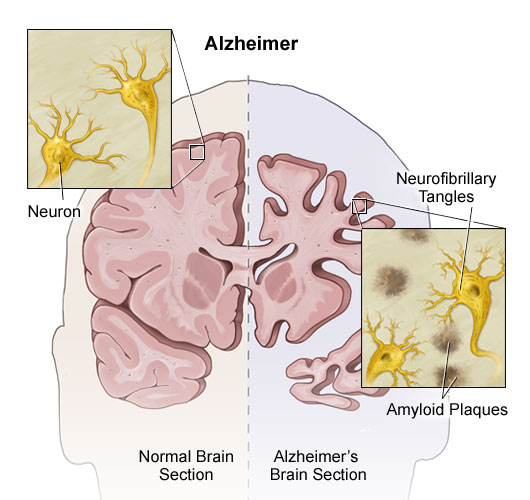 Alzheimer disease is a disease that affects the brain and nervous system. It gets worse over time. Alzheimer disease affects a person’s memory, thinking, personality, emotions, and ability to care for himself or herself. Alzheimer disease has no cure. Medicines may help with some of the symptoms. Caregivers need to be aware of their own needs and ask for help as needed. Over time a person with Alzheimer disease will most likely need to stay in a place that specializes in care for people with this disease.